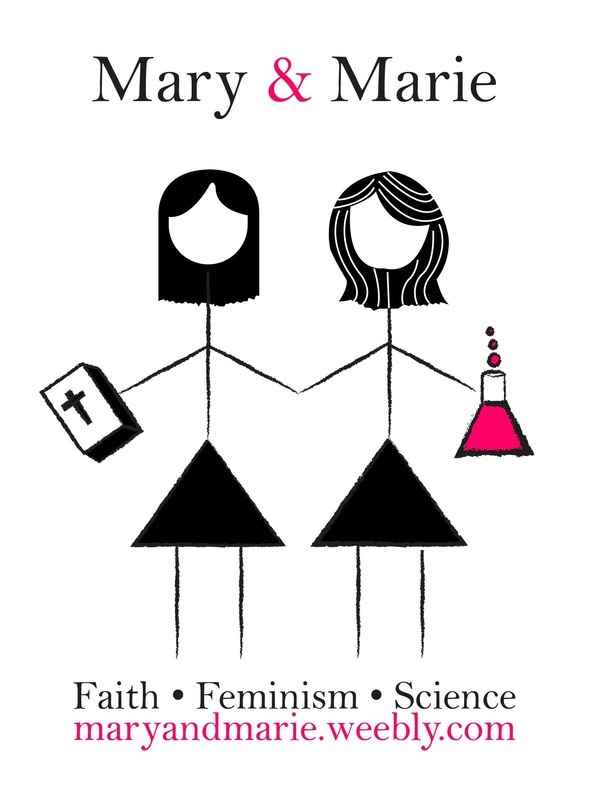 Scientist, Christian, Feminist. Blogging about the- often fraught- intersection of these areas (and other social-justice related issues). Why the name "Mary&Marie"? Click here. I hope this blog will challenge you. I hope that you will find it compelling. And funny. And sad. I hope that it makes you think. I hope that it makes you angry sometimes, the kind of angry that makes you want to change things. I hope it makes you more willing to discuss, less willing to debate; more able to love, less able to judge. I believe in opening doors and opening dialogue. I hope you comment. I hope you share your thoughts and reflections as you read. I hope this will be safe space and community for those who have thought about these issues before, and for those who are just beginning to explore them, perhaps for the first time here. Please feel free to drop a line on the "Share your thoughts!" page! I'd love to hear about your reactions, your journey, your experiences, books or other resources that you think I should check out, etc! I'm also on Facebook and Twitter and Instagram! Like and follow me! In addition to my posts, I also use these accounts to share other articles and such during the week-- so you get additional content by following my social media accounts! You can also email me at maryandmarieblog@gmail.com. New posts will appear weekly, Saturday at noon Eastern Standard Time. I expect and sincerely hope we will have discussions here. I hope this blog becomes a place you can be (anonymously) vulnerable-- and share your experiences and thoughts and journey. Part of the reason I am in academia to begin with is because I love communication and the exchange of ideas, and I love facilitating a discussion. But I'm dealing with some pretty controversial things here. And I am well aware that I will make people angry, possibly often (and not in that makes-you-want-change kinda way I mention above). I ask for your respect. I ask for you to search your heart. I ask that you post encouraging comments quickly and often. I ask that you write angry comments, but wait at least a few hours of thought or prayer before posting them. I am open to criticism, but disrespectful comments will be deleted. Disagreeing comments will not-- but disrespectful ones will. And generally, I have a "one-comment" rule for myself: I will respond no more than once to a disagreeing comment. I will clarify or respond, but I will not debate.